Oh yeah, I’m really a writer and I haven’t talked about writing in a long time. I’ve been pursuing drawing for a couple of reasons. One, sometimes you just need a break from writing. I write novels, big ones with very complex plots and lots of characters and interesting plot twists. It takes a lot of brain power to manage all of it and there are many days when you can’t see the forest, or the trees, or how the heck you are going to get yourself out of the mess you’ve made. One of the beauties of drawing is you get instant feedback. Does that line really go there? Well, lookee, yes it does. Does that squiggly line really look like the leaf in front of me? Kinda. Getting there. What I also found fascinating about learning about drawing is that beginning art students are a lot like beginning writers. Everyone wants to focus on the specific details right now: they want their drawing to look EXACTLY like what they are seeing in front of them. First time writers want their first drafts to be EXACTLY like the book they saw in their head. Both need to learn that you have to plan your project. You pencil in the main elements, find your dark and light areas, get a feel for the totality of the piece and then focus in on the fine detail. 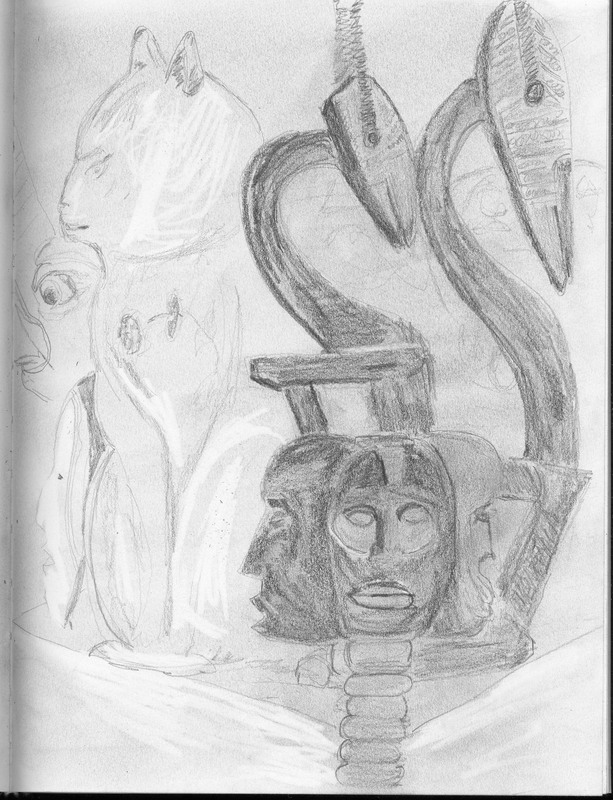 This week I have failed once again to do one drawing a day, but I do want to share what I did in last week’s art class. 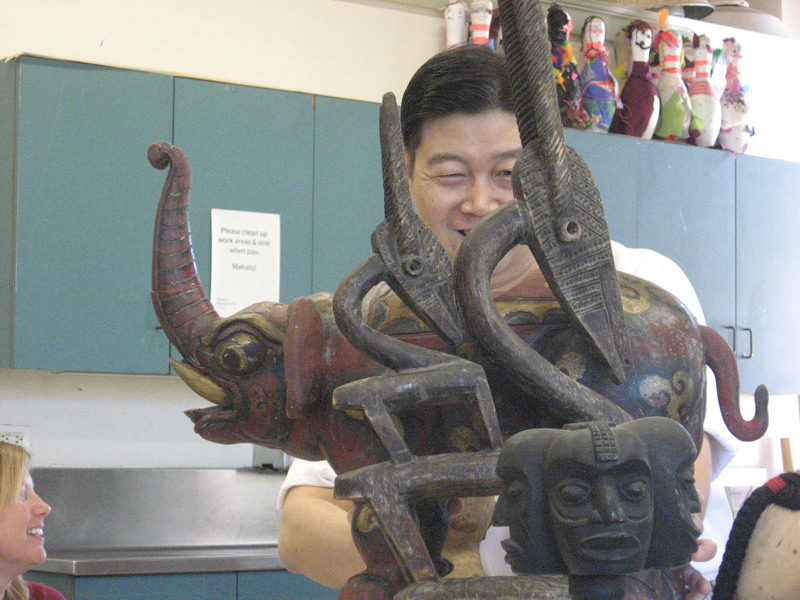 Our instructor, Mr. Lee had us all go down to the art school’s “lending library.” It is a collection of interesting artifacts that are not quite museum quality, but are too interesting to get rid of. 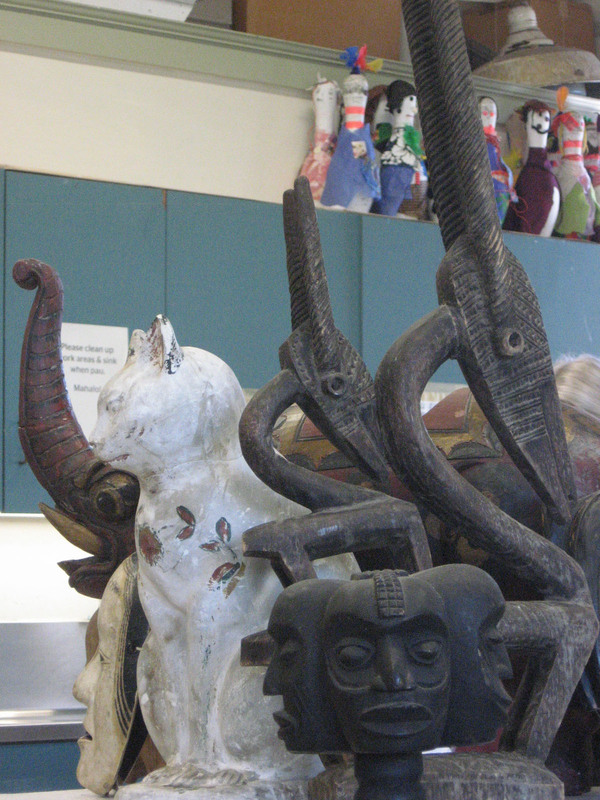 The pieces come from all over the globe and we were tasked with picking out objects that we thought were interesting. We brought them back to our class room and Mr. Lee arranged them on big display tables. We were asked to zoom in on one particular section, I took a photo of the section that I liked to establish my framing. elephant, kitty cat and assorted friends. For the next step of the exercise we used soft pencils or graphite powder to add a mid tone across the entire page. Then we sketched our image, and used erasers to reveal the highlights. It was a fun exercise and I took lots of photos for future still life references. I liked this technique and plant to try it again. Stay tuned for more. I hope you have enjoyed what I’m trying to do, which is practice, practice, practice. You are welcome to use these images in your blogs, all I ask is that you credit them to Rachel Funk Heller and add a link to this site, rachelfunkheller.com Thanks for stopping by!